for weekend breaks and longer holiday stays. This page contains a complete alphabetical list of all the Cotswold Bed and Breakfasts advertising with us. If you want to choose your accommodation by geographical location then please go to our Cotswold Accommodation and click on the place you may want to stay at. The Cotswolds offer a wide variety of Bed and Breakfast (B and B's) and Guest Houses, all invariably superbly located in villages and market towns or the beautiful surrounding countryside. Our list also includes Cotswold Farms offering their own individual style. For Stay on a Farm Bed & Breakfast see also - Farm Accommodation in the Cotswolds. 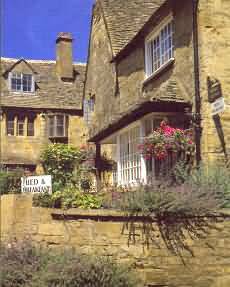 You will find the Bed and Breakfast (B & B) accommodation establishments listed cover the six English counties making up the Cotswolds - Gloucestershire, Oxfordshire, Worcestershire, Wiltshire, Warwickshire and Somerset. The Cotswold Bed and Breakfasts given below are a selection we can recommend to give you unforgettable memories of your vacation to one of the most beautiful and unique regions in England UK, if not the world. Most of the establishments are officially rated and assessed by the two authorised organisations namely Visit Britain (visitBritain) and the Automobile Association (AA). The prices indicated are a guide and are based on two people sharing a room per night including breakfast. For more information about each of the B & B's listed simply click on the name of the Bed and Breakfast, Guest House, or Cotswolds Farm. Romantic monastic manor house set in 8 acres of private gardens and grounds. Luxury four poster double and twin en-suite bedrooms. Medieval Great Hall, Tennis Court and Croquet Lawn. Abbots Grange Broadway £150.00 Luxury & Exclusive Bed and Breakfast. Bridge House Cheltenham £70.00 Only one mile from the centre of Cheltenham. 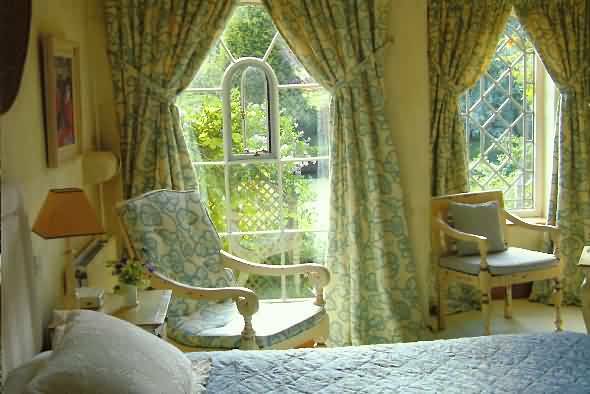 Cowley House B&B Broadway, Worcestershire £70.00 Cowley House is a beautiful mid 18th century Cotswold stone property. Cropredy Lawn B&B Cropredy near Banbury £110.00 Situated in 200 acres of farm land and grass paddocks. Racehorse training - able to view horse gallops. Elms Farmhouse Gretton near Winchcombe £90.00 Situated amongst the rolling hills of the Cotswolds yet within easy reach of Cheltenham. Meadow Rise Guest House Bourton-on-the-Water £70.00 A small select luxury Guest House in the heart of the Cotswolds. Nethercote Fields Shipston-on-StourWarwickshire £60.00 The stable conversion looks out to open fields and the farm. The Guest House Bagendon near Cirencester £140.00 Luxury & Exclusive Bed and Breakfast. The Old Bear Inn B&B Cirencester £65/£85 Old Inn now a private residence offering luxury rooms. The Old Wagon and Horses Chedworth Village £65.00 Located in quiet and picturesque location. Townstreet Farm Tirley , Gloucestershire £70.00 This is an ideal retreat from your hectic life! Uplands Nr Banbury and Stratford-upon-Avon £100.00 Luxury & Exclusive Bed and Breakfast. Windrush View Bourton-on-the-Water £60.00 Only 8 minutes walk to village centre.